Statutory guidance (November 2009) for the UK Border Agency on making arrangements to safeguard and promote the welfare of children. This chapter was updated in October 2015. A number of new national developments such as the Modern Slavery Act 2015 have been incorporated in the update of this chapter and guidance about both trafficked and unaccompanied children has been clarified. The chapter should be read in full. Professionals in all agencies should be aware that refugee and asylum seeking and unaccompanied children, are vulnerable. The children and many of their carers will need assistance to ensure that the child receives adequate care and accesses health and education services. Unaccompanied asylum seeking child(ren) are children seeking asylum, who are under the age of 18 and are not living with a parent. The person who has been caring for him being prevented (whether or not permanently and for whatever reason) from providing him with suitable accommodation. An unaccompanied asylum seeking child should always be referred to Surrey Children's Services and should be provided with the same individual assessment as any other child presenting as beingIn Need. Many of these children will be traumatised by their experiences in their countries of origin e.g. separation from their families, witnessing war atrocities etc. Whenever a professional comes into contact with an unaccompanied child from abroad, the professional should check whether the child is receiving services from Surrey Children's Services. If not, then the professional should make a referral to Surrey Children's Services in accordance withSection 4, Making a Referral of Contacts and Referrals Procedure. Additionally the organised crime of child trafficking into the UK has become an issue of considerable concern to all professionals with responsibility for the care and protection of children. Any form of trafficking children is an abuse. Children are coerced, deceived or forced into the control of others who seek to profit from their exploitation and suffering. Some cases involve UK-born children being trafficked within the UK. Most children are trafficked for financial gain. This can include payment from or to the child’s parents. In most cases, the trafficker also receives payment from those wanting to exploit the child once in the UK. Trafficking is carried out by organised gangs and individual adults or agents. Whenever a practitioner comes into contact with a child, who may be trafficked, the practitioner should check whether the child is receiving services from Surrey Children's Services. If not, then the practitioner should make a referral to Surrey Children's Services in accordance with Contacts and Referrals Procedure, Making a Referral. Surrey Children's Services should carry out an Assessment regardless of the child's immigration status. Where there are concerns about trafficking during the assessment consideration should be given to actioning a Strategy discussion/ meeting, see Strategy Discussions and Section 47 Enquiries Procedure. Based on the assessment Surrey Children's Services have a duty to provide appropriate support and services to all unaccompanied asylum seeking children. In the majority of cases this assessment will lead to them being Accommodated under Section 20 of the Children Act 1989. If the UASC is deemed to be over the age limit a referral should be made to the UK Visas and Immigration. Following the assessment, an age assessment must be undertaken to establish as closely as possible the child’s age and eligibility for services. The issue of age assessment in social work with asylum seeking young people remains controversial and has been something that Children’s social care have struggled with since the millennium. The ADCS Asylum Task Force has worked with the Home Office to provide two new jointly agreed documents, as detailed below. These documents are offered as practice guidance, by way of assistance to local authorities and their partners. The use of the proforma and consent form is voluntary. The content does not, nor does it seek to, be binding on local authorities. It is simply a recommended approach. Age Assessment Information Sharing Proforma. A child at risk of being trafficked who is provided with care and accommodation must, where possible, be placed within the county in accommodation that provides the level of supervision proportionate to the need to protect them. This may include protection from possible abduction by an unidentified person and in some cases require surveillance cameras in operation around the home and the monitoring of telephone calls. The location of the child must not be divulged to any enquirers until they have been interviewed by a social worker and their identity and relationship/connection with the child established, with the help of police and UK Visas and Immigration, if required. Where appropriate and possible, steps must be taken to make contact with the child’s parents in the country of origin (immigration services may be able to help) to find out the plans they have made for their child and to seek their views. Steps must be taken to verify the relationship between the child and those thought to be their parent(s). Foster carers/residential workers must be vigilant about anything unusual e.g. waiting cars outside the premises and telephone enquiries. If they consider the child is in immediate danger, they must contact the Police straight away and pass on any information on the child (concerning risks to their safety), which emerges during the placement. Anyone approaching the local authority and claiming to be a potential carer, friend, member of the family etc. of one of the children, should be investigated by the social worker, the Police and UK Visas and Immigration. If the first line manager is satisfied that all agencies have completed satisfactory identification checks and risk assessments the child may transfer to their care. If a worker suspects a child is a victim of trafficking they will need to inform the National Referral Mechanism, which is a framework for identifying victims of human trafficking or modern slavery and ensuring they receive the appropriate support. The child’s details should be provided using the forms available on the NCA National Referral Mechanism website. 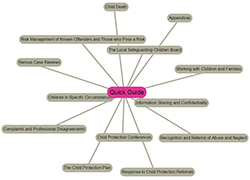 (The tick box matrix in section C has been designed to save time in completing the form by providing recognised child trafficking indicators which can be marked quickly and expanded upon in Section D). Click here to view the relevant forms on GOV.UK website. Since the 31st July 2015, all UK referrals, to the NRM Competent Authority (trained decision makers) must consider whether the person is a victim of human trafficking. In England and Wales, if someone is found not to be a victim of trafficking, the Competent Authority must go on to consider whether they are the victim of another form of modern slavery, which includes slavery, servitude and forced or compulsory labour. This relates to the Modern Slavery Act 2015. Contact information can be obtained via the Foreign and Commonwealth Office or the relevant Embassy or Consulate. Additional information about the NRM can be accessed on the National Crime Agency website. This page is correct as printed on Friday 26th of April 2019 02:40:33 PM please refer back to this website (http://surreyscb.procedures.org.uk) for updates.